Marketed as a no-frills alternative to pricier hotels in Singapore’s city centre, capsule hotels are proving to be an attractive option for millennials travelling on a shoestring budget. In February this year, husband-and- wife business partners Benedict Choa and Sonia Anya opened a 56-bed boutique capsule hotel in the historical Kampong Glam neighbourhood. The hotel is the result of extensive renovations of three linked conservation shophouses that previously housed a budget hostel that squeezed up to 40 guests in one room. The couple owns and manages Cube Boutique Capsule Hotel, a niche hotel brand that offers capsule beds. 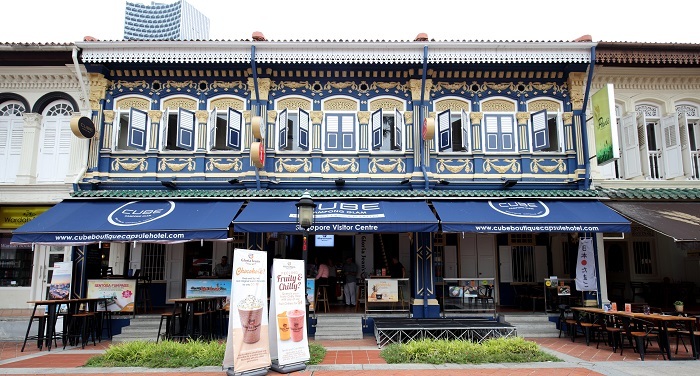 This is their second capsule hotel, and it is located on Bussorah Street, near the historical Masjid Sultan — a mosque built in 1824 and rebuilt in 1932 — as well as F&B and entertainment outlets on Haji Lane and Arab Street. Capsule hotels such as Cube’s occupy a niche in Singapore, as budget-conscious travellers to the city state may find mainstream hotels too pricey; on the other hand, lowend hostels may not appeal to them. It is no surprise, then, that new capsule hotels have opened their doors to keep pace with Singapore’s tourist growth. Last year, total tourist arrivals grew 6.2% to surpass 17.4 million, according to the Singapore Tourism Board.